MIAMI (AP) — Like hurricanes Harvey and Katrina before it, Florence will be remembered for unleashing a staggering amount of water over a vast area. The flooding unfolded just as forecasters expected, but many residents in the Carolinas still seemed caught off guard as they were plucked off a vehicle’s roof or pulled by boat from their flooded homes. Whether they were just stubborn, short of resources to leave or believed they had already seen worse devastation, all will be haunted by what the water has swept away. —Storm deaths: Florence is being blamed for at least 34 deaths in three states, and Typhoon Mangkhut has killed at least 74 people in the Philippines and China. Officials in the Carolinas are worried about what deaths are still to come amid the swelling rivers and flooding from Florence’s crawl across both states. So far, several people have died after being swept up in the stormwaters , and falling trees have killed two small children. A Philippine police officer says residents of a mining camp in a mountain village refused to leave ahead of the powerful typhoon, believing their chapel and nearby bunkhouses were on stable ground. Now dozens of people are missing after a massive landslide buried the structures. One of North Carolina’s largest cities still is mostly cut off by floodwaters, so food, water and tarps are being brought into Wilmington by big military trucks and helicopters. More than 60 percent of homes and businesses were without power, and crews have completed about 700 rescues in the county where Wilmington is located. SAVE HOMES OR A HIGHWAY? A wall of concrete barriers and plastic sheets is being built along U.S. Highway 501 to save the main road into Myrtle Beach , South Carolina, from going underwater. Residents in the nearby town of Conway worry that’s going to send water from the rising Waccamaw River to flood their homes instead. 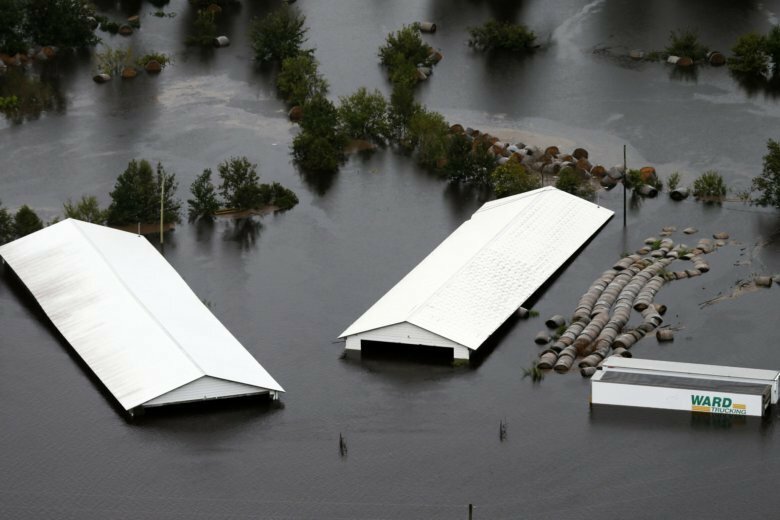 At least one North Carolina dam has breached so far under the strain of Florence’s flooding, but officials say no homes were affected. False alarms about dam failures have caused panic in a state where there is a lot of concern about whether many dams already in poor condition will hold as rivers keep rising. South Carolina’s governor was doing a flyover of Florence’s flooding in his state when he spotted two men stranded atop a flooded pickup truck. After watching the rescue, Gov. Henry McMaster said water in that part of Chesterfield County rose at least a foot (30 centimeters) after the men initially were spotted. Experts say people likely got complacent about Florence because of a scale that only categorizes hurricanes by wind strength . Water is responsible for the vast majority of deaths in hurricanes and tropical storms, but that hazard isn’t included in the system forecasters used when they described the storm as a “Category 1 hurricane” at landfall. Relying just on a smartphone to steer out of a disaster zone is not a smart idea. After some navigation apps or in-car map directions sent people in North Carolina onto roads that got flooded or blocked by debris, Google-owned Waze said it was working with local governments and its own community of volunteer map editors to mark closures of more than 1,300 roads in North Carolina and hundreds more in South Carolina and Virginia.